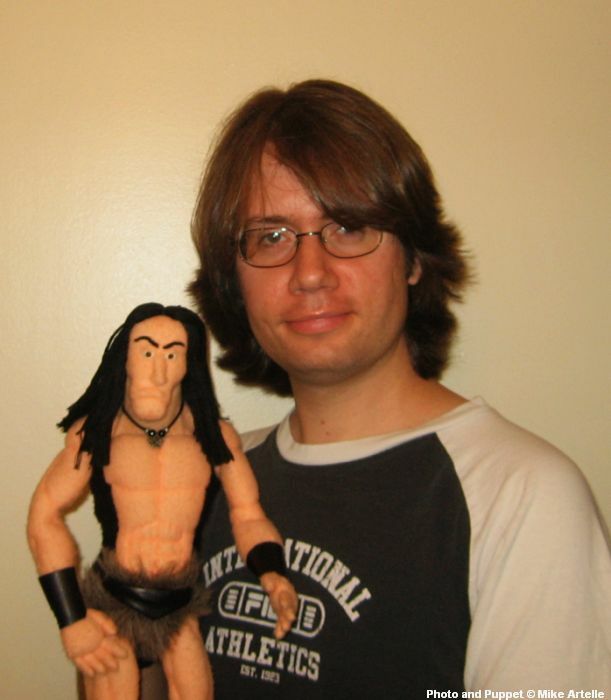 Here I am with one of my puppet characters, Pythor the Barbarian, in 2010. One of the unique things that a lot of gay people experience as a result of supressing their identities during their teenage or young adult years is a delayed adolescence. As we are so involved with conforming to the surrounding social norms and expectations in our earlier years, gay guys like me (of my generation or earlier) often missed out on all the normal things that a teenager and young adult were suppose to do, such as going on a first date, or dancing at the prom, and so on. In addition, gay guys who go through what I did in struggling with societies intolerance toward homosexuality, have fewer opportunities to genuinely develop their social skills or dating skills, and therefore are more likely to end up single later in life when most heterosexual couples are settling down and having kids. As such for some gay folks there is a domino effect that has come into play which causes a gay man's usual "timeline" for life events to be thrown out of sync with his age. So if you ever see a grown man who is gay acting like a teenager, or if he comes across as being immature for his age, now you know exactly why. He is simply acting out those social situations which, by no fault of his own, he missed out on earlier in life. I've been fortunate to have had some memorable experiences with my past boyfriends, however in many ways I still find myself dealing with this delayed timeline effect now that I'm in my early 40's. For starters, I certainly hadn't planned on being single at this point of my life! Being such a shy person complicates things even more, so I have my work cut out for me. All this to say that things have certainly improved dramatically today in terms of gay equality and inclusion into society. Being gay is still not a walk in the park but it is certainly a lot easier in that today, kids and teens who realize that they are gay can actually just be themselves, and be gay! How truly fortunate they all are to be young in a tolerant society. If I could go back and be a gay teenager in today's world instead of the 1980's and early 90's, I would do so in a heart beat.